The Deep-cycle battery. State of the art. The Trojan Battery Company has already been a pioneer in the development of premium Deep-cycle batteries acclaimed the world over since 1925. This powerhouse in its familiar chestnut-brown colour includes unique registered technological developments to ensure excellent performance. 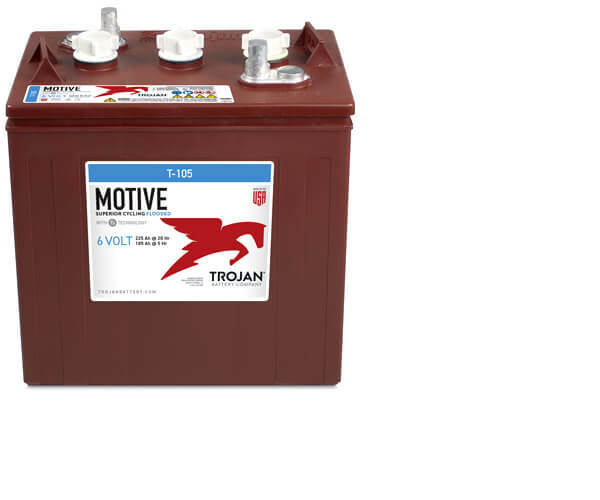 Reliable, durable and constant energy are the marks of each Trojan battery. 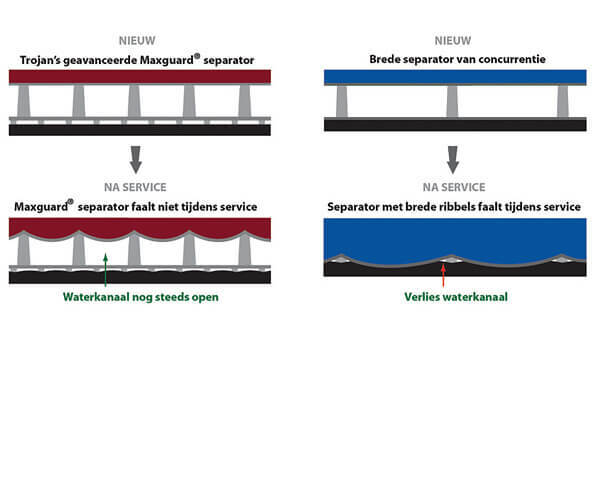 Emrol is proud to be the Master Distributor of this prestigious brand for Benelux. Longer life span and better performance “S” shaped ribs on the rear of the separator help to keep the negative plate completely wet by evacuating charging gases faster. On the front of the separator the thick ribs ensure the optimal flow of electrolyte. Both properties result in efficient use of the active material. The rubber separators slow the migration of antimony from the positive to the negative plate. A thick glass fibre foil supports the active material. Less water consumption and lower maintenance costs. The need for a charging current at the end of charging is less than half of what is required by certain other separators. Trojan Deep-cycle batteries are supplied with exclusive Alpha Plus® lead paste with high density for higher performance. The Trojan grid technology is an antimony alloy lead mixture specially developed for use with Trojan Alpha Plus® paste. This combination offers extremely strong adhesion between the Alpha Plus® paste and the grid frame. This ultimately results in considerably improved battery performance and a significant drop in maintenance costs. The special polyolefin composition results in an exceptionally strong and light housing for batteries for intensive use such as in cleaning machines, elevating platforms and systems for renewable energy. Larger ventilation caps reduce the risk of acid leaks in applications with deep discharges. The Trojan’s specific ventilation system means less water consumption, lower maintenance costs and a notable increase in safety. As a world leader in Deep-cycle batteries, Trojan knows the great importance of scheduled maintenance and its impact on the life span of a battery like no other. Trojan’s Hydrolink™ central water filling system is a highly innovative solution. The focus is on topping up the batteries more quickly, simply and safely.